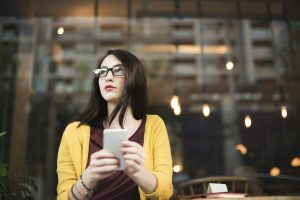 Is your business easy to find in voice search? It is definitely something that you should be thinking about if you want to connect to customers that use their phones looking for your services. Voice search has been growing rapidly, and there’s no reason to think that will change. It’s not just a fad—it’s becoming the new normal. With 41% of adults (and more than half of all teens) using voice search daily, and 65% of Google Home and Amazon Echo users saying they have no intention of going back to regular search, voice search is here to stay. It’s time to ensure that you know how to get found in voice searches. Voice search also focuses more often on one’s immediate vicinity, with queries seeking goods and services “near me”. 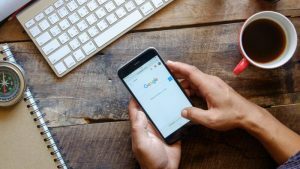 To be relevant and connect to voice searches, you will need to understand how questions are being asked in order to give the best possible answer. Fail to do that, and your chances of being seen will plummet. As mentioned above, searches are moving away from awkward-sounding words to natural phrases. Those using voice search don’t rely on two or three simple terms, using natural language instead. As a result, when researching keywords, you need to look for more than search volume to seek out logical phrases that fit into the conversation. While you may have at one time been hesitant to use longer keywords, now you needn’t fear full sentences. Normal keyword length has now practically doubled. That isn’t to say you need to optimize a full page around full-length sentences, but again, aim for natural speech. Have these terms appear logically throughout your content. Google will find it, wherever it may fall, and react accordingly. A natural consequence of using more conversational search is that the searches are now much more likely to be actual questions. Who, what, when, where, and why are now a much bigger part of search questions. Your content should be written to reflect these types of questions, as well as questions that now specify “near me”. Questions may be changing, but so are the answers. With Google employing featured snippets, answers to question searches should be of a size to be displayed in this feature, meaning they should be in the range of 29 words. Of course, making pages with 29 words of content doesn’t make sense, but the perfect solution exists: FAQ pages. By creating an FAQ with answers under 30 words, you can bring dozens, even hundreds of voice searchers to the same page on your site and create many opportunities for featured snippets. This becomes even more important with Google Home and Alexa because those devices will provide a single response to queries. While you want to have snappy, accessible answers suitable for snippets, having longer-than-average articles actually benefits you as well, giving more opportunities for your keywords and natural speech to shine. First page Google results have typically been about 1,900 words, but those that perform well in voice search are averaging just over 2,300 words. Learn more from a digital marketing consultant. Another noticeable change has been the rise of video snippets, video results in the top position, much like featured snippets. These video results to voice queries are a good indicator of where Google will be placing emphasis as regards to voice search going forward. Having your site ready for voice search does not need to involve tremendous amounts of work or a dramatic reworking of all of your content; a shift in approach from robotic, short keywords to a more natural, conversational style will be a major contributor to your success. Google prizes a good user experience above all else, so keeping the customer in mind while talking to them in a normal conversational manner, along with a few other changes, will help to get your content in front of more eyes. Touch base with our digital marketing agency to learn how an SEO agency can help you rank for voice search on Google.